Tom Dean says when he worked as a music teacher he faced a daunting task every summer – the job of sorting through mountains of new sheet music to find the gems that might work for his school choirs. That changed when he discovered a service called Editors’ Choice. It made finding quality music much easier. Now Dean is J.W. Pepper’s Classroom and School Choral Editor, and he is part of the team that puts together the Editors’ Choice lists. These lists take a lot of time and expertise to curate. The process begins when hundreds of publishers send their latest releases to Pepper. Each year Pepper’s editors review more than 21,000 titles, and based on detailed criteria, select the best new music in a variety of categories. The choices are then shared on Pepper’s website, its catalogs, and in its new podcasts. “It’s like the endcap in a grocery store – it’s the best of the best right at the end of the aisle,” said Tom Sabatino, Manager of Choral Product Sales. To make these selections, Sabatino says it’s important for the team to review everything with the critical ear of the customer. Depending on the type of music, this may include looking at aspects such as lyrics, range, difficulty, piano accompaniment, and instrumental needs. Teams work in small groups based on their backgrounds and expertise to review choral and instrumental music for both schools and churches. Ian McLoughlin, Manager of Instrumental Product Sales, says he relies on the extensive knowledge of his team to get the job done. Tom Dean reviews choral music with other J.W. Pepper editors. One of Pepper’s team members, Jennifer Moorhatch, worked as a teacher for 19 years before joining the company. Like many on the staff, she has spent years in the trenches – teaching in the classroom, giving private music lessons, and working as a church musician. Moorhatch says she wants to give students songs they’ll remember and sing their whole lives. But more than that, she also hopes to assist busy music teachers: “We’re trying to save you time to make it as easy as possible to find the best new music,” Moorhatch said. A number of customers have shown their appreciation for Editors’ Choice. Bob Wilson worked for 17 years as Director of Bands at William Penn Charter School in Philadelphia, Pennsylvania. In that position, he balanced the needs of students in sixth through twelfth grades in groups ranging from concert and jazz bands to percussion and string ensembles. He used Editors’ Choice throughout those years to pick works for every musical purpose. He says he found other lists are based on marketing, but Pepper’s lists are different. “When I pick a piece I want something that the kids are going to like, that the audience is going to like, that I’m going to like and has educational value, and I feel like most of the pieces that I listen to on the J.W. Pepper selections have always been in those categories,” Wilson said. Editors’ Choice isn’t just for schools – Pepper also has lists for churches and community music groups. Chris Titko is Pepper’s Church Music Editor and has done professional church work for 38 years. He has helped Pepper expand its offerings from traditional church pieces to music for any denomination. Choices range from liturgical music to songs that are on contemporary Christian radio. Ken Selinger, who is the music director at Christ’s Lutheran Church in Oreland, Pennsylvania, says he has been using Editors’ Choice for as long as he can remember. Over time his church’s staff noticed the pieces Pepper was selecting fit their style much better than other church music services. That cemented their desire to stop looking elsewhere and stick with Editors’ Choice when making their music selections. “I think it’s very valuable to have someone who has an idea of what churches are looking for,” Selinger said. Both the newest Editors’ Choice selections and those chosen over the years also have another advantage – access to full-length sample recordings. Reimers sometimes uses these recordings to give the students a say in what they want to sing. She says her classes will listen to several recordings to give feedback about pieces. Selinger also notes distinct benefits to having a complete piece to review. For example, a work may start with one sound and then build as it progresses; with a full-length recording, a director can judge if the piece will work for a particular group’s capabilities. “I think having the full piece is helpful in having confidence in a selection,” Selinger said. 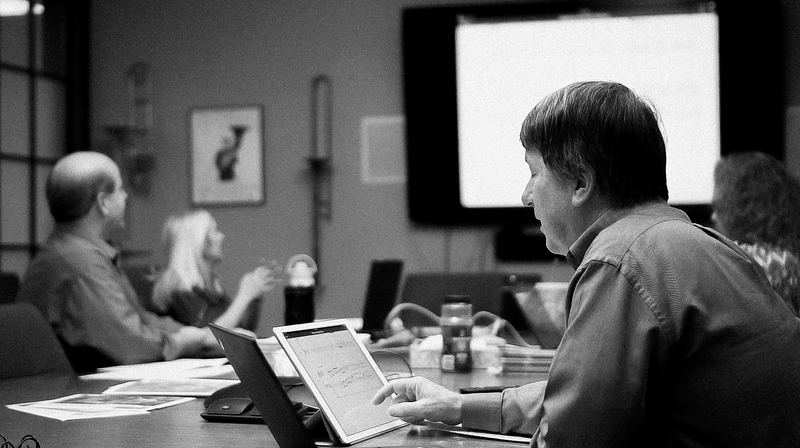 Selinger and Wilson likewise use the recordings for a common purpose – to allow groups to hear what a composition is supposed to sound like when it is performance-ready. Wilson says he has frequently played recordings so the students could listen to a professional rendition. Over the years, Wilson listened to the Editors’ Choice recordings on CDs during his long commute to work. Now to listen to the music, customers can go online or access Pepper’s podcasts for free. These podcasts are available on Soundcloud and Apple Podcasts. The music can be streamed or downloaded for offline listening. 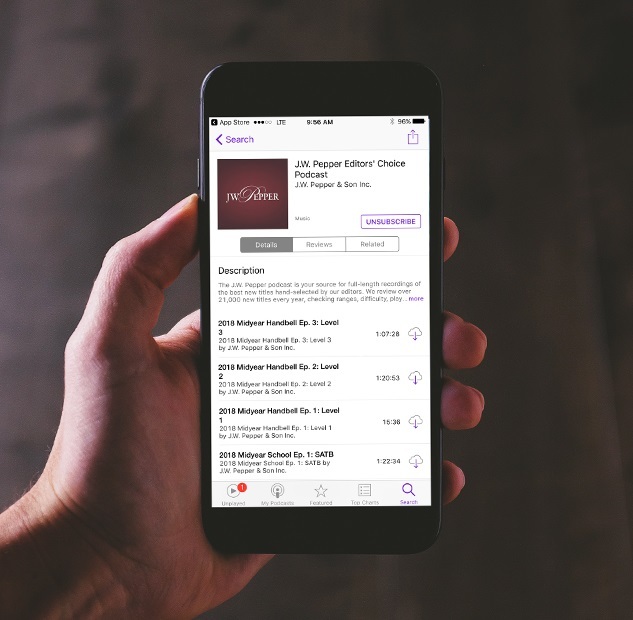 The podcasts offer several broad categories, such as Editors’ Choice Fall School Choral 2018 – Christmas & Holiday. Then they are broken down to particular episodes, such as SATB Christmas and Holiday. To learn more, visit our Editors’ Choice webpage and log in or create a free account. Mary Rogelstad joined Pepper in 2018 as the company’s Marketing Content Coordinator. Previously she worked as a journalist in the international media and as a communications specialist at various nonprofits. In her free time, Mary has enjoyed singing in various choral groups and performing in musical theater.